Through the month of May, Ryan McGinness will offer a series of drawings, sculptures, sketches and paintings across Los Angeles in 7 different locations. The Standard Hotel presents McGinness' latest installation on the west coast at The Standard - Hollywood. Meanwhile, The Standard - Downtown will offer installations, events, live drawings, and exclusive Blacklight Nudie Cards. 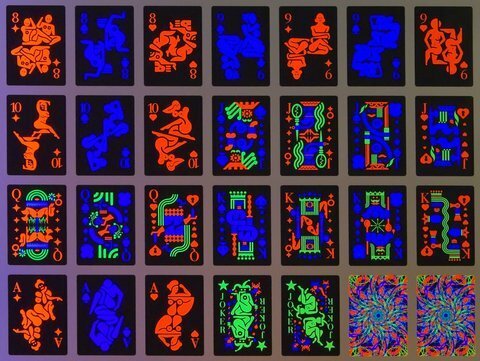 The Blacklight Nudie Cards, the first of their kind, are a full deck of poker-sized playing cards based on vintage nudie cards. The poker-deck-meets-graphic-Kama-Sutra-spirit with Ryan’s iconic graphics emit only a frequency in the invisible range of 350-370n and best enjoyed under blacklight. "My use of fluorescent paint under the blacklight color spectrum is a strategy to force a singular time/space experience with the work", shares Ryan. "That is to say, the work must be experienced in person, and cannot be fully appreciated through reproductions via jpgs or printed catalog pages." May 28-June 11 - Women: The Blacklight Paintings at the Purple Lounge at The Standard, Hollywood’s Purple Lounge.